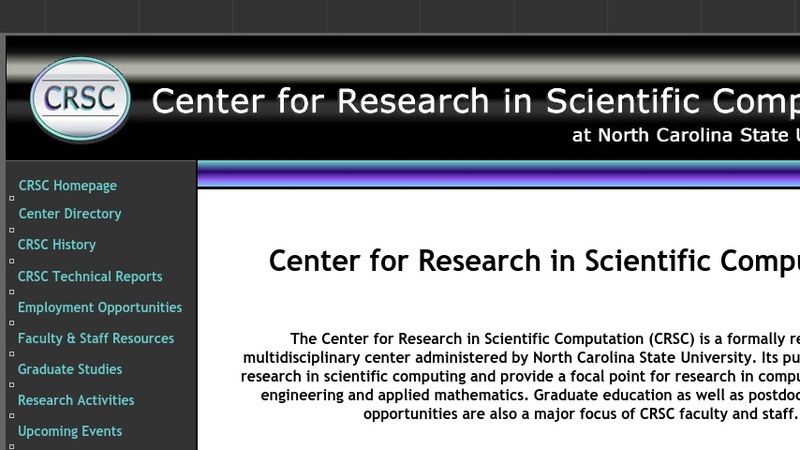 The Center for Research in Scientific Computation (CRSC), based at North Carolina State University, aims to "foster research in scientific computing and provide a focal point for research in computational science, engineering and applied mathematics." The Center has developed a teaching experimental laboratory "where students are exposed to experimental design and data collection through demos and actual hands-on experience." The Center's multidisciplinary research addresses topics in scientific computation such as Numerical Optimization and Control, Numerical Solution of Ordinary and Partial Differential Equations, Mathematical Modeling and Analysis; Numerical Linear Algebra, and Parallel Computing. This website describes the Center's projects and offers links to the project websites. An online database makes available CRSC technical reports from 1992 to the present.